Here comes a powerful suite of social marketing apps. 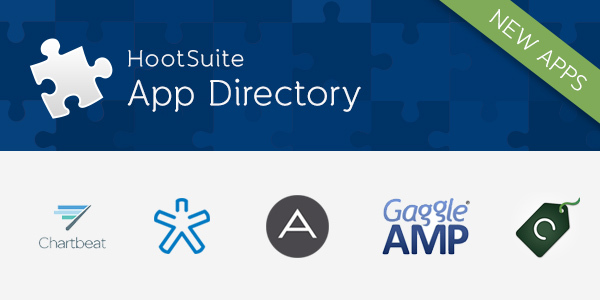 Five new or updated HootSuite apps are now part of our growing App Directory. A brand new App.net integration, upgrades to existing Customer Relationship Management (CRM) and Analytics apps, along with new tools for online commerce and company-wide messaging. App.net is a social network that lets you choose how you interact with others through a variety of amazing social apps. From group messaging apps to talk with friends, to file storage apps used for photo and document sharing, this ad-free social network puts the power of meaningful social interaction in your hands. View post streams and mentions from your App.net community, search the network, or reply, repost and star posts within your stream. 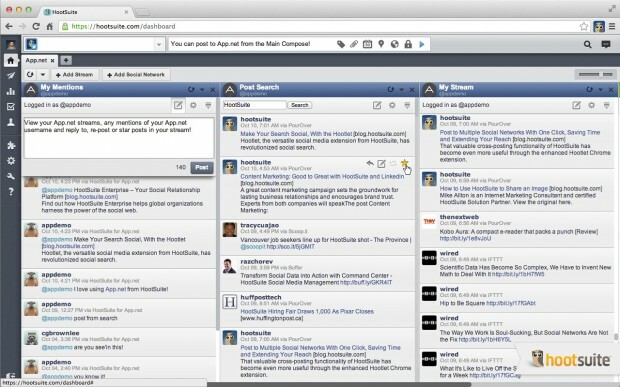 Valuable App.net functionality has now become more accessible than ever, through this new HootSuite app. Within the app you can compose new posts for your App.net account within the HootSuite publisher box. You can also view post streams and mentions from your App.net community, search the network, or reply, repost and star posts within your stream. This powerful new integration is perfect for social media users who use several apps to interact with their networks online. The App.net app is immediately available for free to all HootSuite users. The Nimble app for HootSuite has undergone a significant upgrade, experience even more social CRM functionality from within your dashboard. Perfect for marketers and community managers, allowing for more effective communication between your company and your contacts from one central platform. Users are able to log notes, activities and deals, among other advanced capabilities. The Nimble App gives you the power to view your Nimble contact details within the HootSuite dashboard, and import new contacts into Nimble right from HootSuite social streams. Recent conversations can be accessed within the app at the click of a button. Plus, users are able to log notes, activities and deals, among other advanced capabilities. 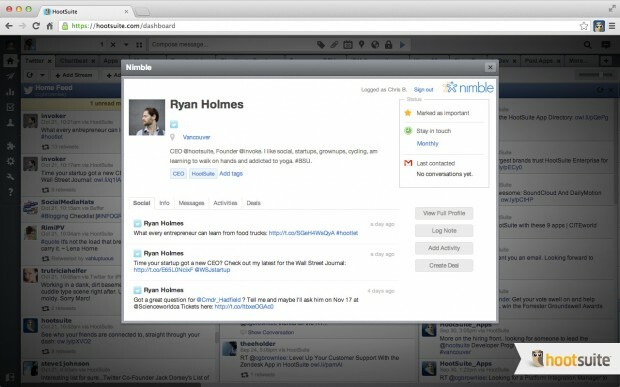 With the Nimble app for HootSuite, take care of social CRM and social media, side-by-side. The social web moves at a blinding speed, so content producers need a tool that provides them with real-time insight into what is performing, and what isn’t. The upgraded Chartbeat app for HootSuite does just that and more. The app allows you to track the impact of a tweet on your engagement, to directly tie your social messaging to web traffic and prove the ROI of social campaigns. The Chartbeat app provides real-time traffic data for content on your websites, for page visitors and social activity, allowing you to take action on the best (and worst) performing content. The latest update allows you to monitor which pages are getting the most traffic from social media sources. If you see a post attracting high social traffic, you can easily push that content over several social networks within HootSuite. The app also allows you to track the impact of a tweet on your engagement, to directly tie your social messaging to web traffic and prove the ROI of social campaigns. 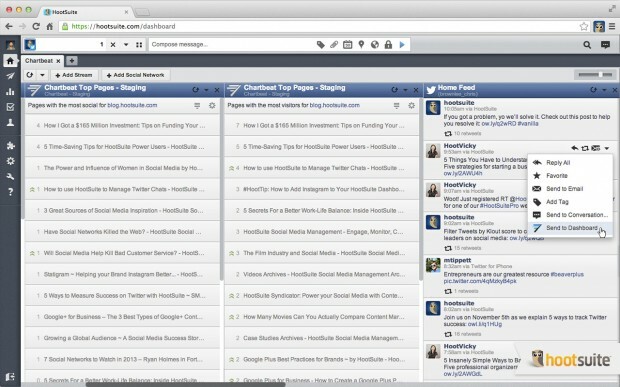 Unite your social media and web properties with the Chartbeat App for HootSuite. The Cashie Commerce App for HootSuite is tailored to online sales, helping you increase traffic and revenue with the ability to share products and promotions across social networks. Conveniently have access to all your product and promotions information right from the HootSuite Dashboard. Try this app today. Want to share big company news with a wide net of people? The GaggleAMP app for HootSuite allows companies to engage stakeholders, employees and customers, encouraging them to promote synchronized social messages across several networks. Boost your web traffic, leads and social interactions by publishing and amplifying social messages on one dashboard. Try this app today. Designed to extend the social content ecosystem of the HootSuite dashboard, the HootSuite App Directory offers a rich set of tools to manage your online presence.